Galway is the fourth largest city in the Republic of Ireland and the only city in the province of Connacht in Ireland. The city also bears the nickname City of the Tribes for the fourteen "Tribes" (merchant families) that originally settled there. Galway is a perfect base for seeing the West of Ireland, but it is also worth a visit in itself. Galway is the unofficial cultural capital of Ireland and its lively arts scene peaks during the summertime Galway Arts Festival. The Galway Races take place every year in Galway for one week, starting on the last Monday in July. This is a particularly busy time and is the most expensive time to stay. In the city, there are extra crowds which make it difficult for restaurant reservations and most pubs are very busy. Traffic also comes to a stand still around the race times, which vary every day. Located in the heart of Galway Bay, on the very edge of Europe, the Islands are rich in the language, culture and heritage of Ireland. Here the locals speak Gaelic and you sense the spirit of Gaelic Ireland. 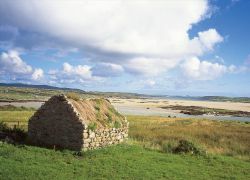 Aran will take you back to an Ireland of Celts and Early Christians. The Islands offer breath-taking scenery, ecclesiastical ruins from early Christian times, medieval castles, cliffs, prehistoric stone forts (including the famous Dún Aonghasa ring fort), sandy beaches. The Cliffs of Moher are one of Ireland's top visitor attraction. The Cliffs are 214m high at the highest point and range for 8 kilometres over the Atlantic Ocean. O'Brien's Tower stands proudly on a headland of the majestic Cliffs. From the Cliffs one can see the Aran Islands, Galway Bay, as well as The Twelve Pins, the Maum Turk Mountains in Connemara and Loop Head to the South. The Cliffs of Moher are home to one of the major colonies of cliff nesting seabirds in Ireland. Included within the site are a cliff-top maritime grassland and heath, and a 200 metre zone of open water, directly in front of the cliffs to protect part of the birds' feeding area. The designation covers 200 hectares and highlights the area's importance for wildlife. Outside of Galway City, the wild and sparsely populated Connemara region offers spectacular scenery of valleys, mountains and lakes and unparalleled hill walking across the peaks of the Twelve Bens. The coast line is wrought into rocky inlets sheltering white sand beaches, and is studded with the beautiful Aran islands.